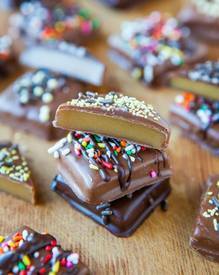 Chocolate covered 7 minute caramels! If there’s one thing I like better than homemade caramels, it’s homemade caramels dipped in chocolate. And decked out with sprinkles. They make everything better.